7737 Coast Guard 4WD & Jet Scooter is a City Coast Guard set released in 2008. It includes 130 pieces which build a Coast Guard 4WD truck with a trailer attached, a jet scooter, several accessories, and a Coast Guard minifigure. 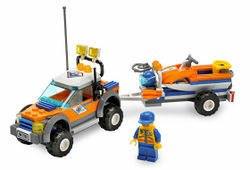 The set was included with the 66290 City Coast Guard Value Pack product collections. This is a description taken from LEGO.com. Please do not modify it. Emergency in the water! Patrol the beach in the powerful 4WD truck. When someone’s in trouble, launch the jet scooter and race through the waves to save them. Includes truck, boat, trailer, diving equipment and Coast Guard minifigure! Includes mask with snorkel, flippers and oxygen tank for diving! Remove the jet scooter from the trailer! Trailer detaches from the truck! Truck and attached trailer measure 8½" (22cm) long! Facts about "7737 Coast Guard 4WD & Jet Scooter"
ShopDescription Emergency in the water! This page was last edited on 9 January 2016, at 21:08.